When it comes to mountain biking, failing to prepare for the occasional trail-side hiccup can really put a damper on your ride. 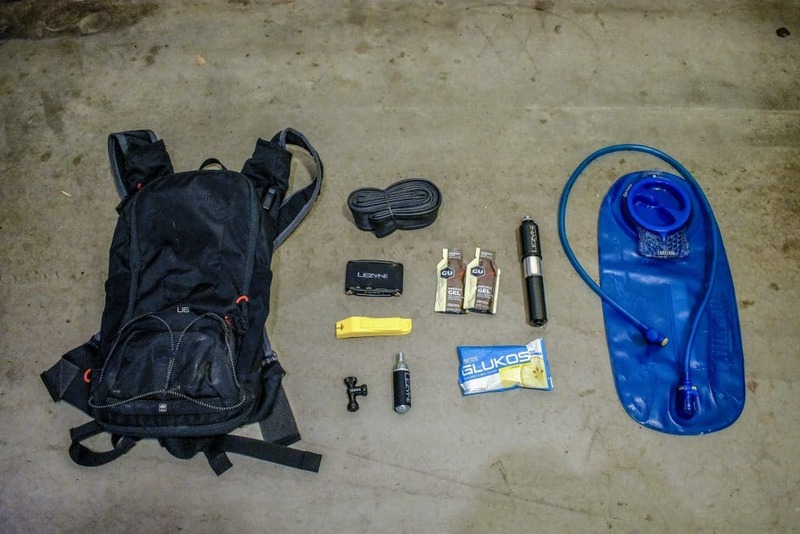 It's best to prepare yourself by carrying some of the essential mountain biking tools with you on your ride. When preparing your gear for a mountain bike ride, there are a few factors you’ll want to consider. How long are you planning to ride? What is the trail like? What about the weather? 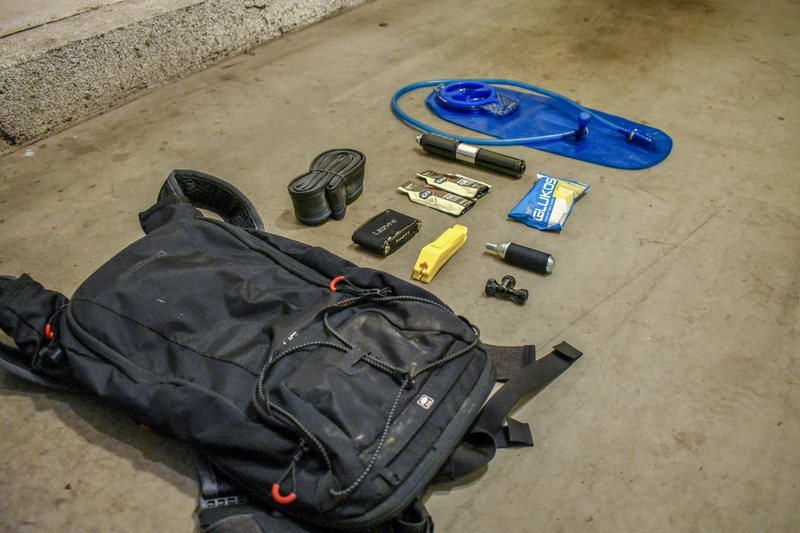 These are the questions you need to ask yourself when you’re preparing your riding pack. From there, you can prepare yourself with the essential items to set you up for an enjoyable mountain bike ride. I’ll break down the list of essential mountain bike items you’ll want to carry on your ride, as well as the different types of mountain bike packs you can ride with. The main idea is to be prepared with the minimum amount of essential items to keep you rolling in case you encounter some hiccups along the way. The last thing you want to do is end up with a flat or mechanical issue 7 miles from the trailhead, forcing you to hike a bike back to your car. I’ll highlight some of the essentials to pack in your bag to keep you prepared – tools, nutrition, and first-aid items to help keep you rolling on your next mountain bike ride. The type of pack you’ll want to carry can really depend on the type of ride you are planning to go on, as well as the type of rider you are. 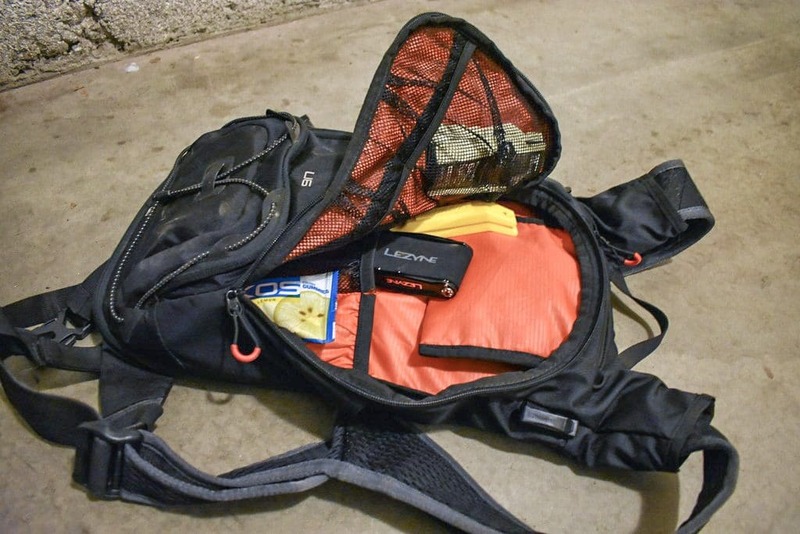 Traditionally, mountain bikers will wear a backpack style bag, but recently there has been a trend shifting towards the “fanny pack”, or hip pack, style bags. I tend to go with a backpack style bag, since it allows you to carry a larger hydration bladder inside while also giving you more room for your tools, cell phone, etc. A hip pack is a good option for people who dislike the extra weight or having a backpack style bag on their back. A hip pack works well for shorter rides where you may not need to carry water other than in your bottle cage. Although, there are now companies manufacturing hip packs with small hydration bladders as well. For those who wear Lycra on the trail, sometimes the pockets in your jersey can suffice as storage. Ultimately, this comes down to personal preference and what’s the most comfortable for you when riding. There is a wide range of mountain bike bags available in the market, ranging from simple and affordable to the more expensive options with added functionality, suiting the needs of all types of different uses and consumer preferences. For example, I like the Evoc Hip Pack Race because it can accommodate a hydration bladder and fits snug to the body. There are also hip packs available without the hydration bladder feature, such as the Hunter Cycles Shred Pack. The Shimano Unzen Enduro Pack is a good option if you’re looking for a technically designed mountain bike pack equipped to carry just the essentials. The Dakine Seeker 15L Mountain Bike Pack features an added a spine protector making it appealing for a consumer looking for an extra protection boost from their pack. The Hip Pack Race from Evoc is a nice option for a smaller pack that doesn’t require shoulder straps. The nice thing about this pack is that it includes a hydration pack bladder but also can also carry a water bottle if you wish. The Unzen Pack from Shimano is nice because it’s available in a range of size capacities – 2L, 4L, 6L, 10L, or 14L. The X-Harness system technology on this bag makes it comfortable to wear on longer rides while keeping your pack secure to your body. Various compartments and pockets allow you to keep a day’s worth of gear with you. The basic essential tools you’ll want to carry in your mountain biking pack include a Mini Tool, Spare Tubes, Mini Pump and Tire Levers. You’ll want to carry a mini-tool to make any trail-side adjustments during your ride. This can include tightening loose bolts, adjusting your seat, etc. There are several types of mini-tools options, all available in varying sizes offering different functions. You’ll want to look for something compact, but with enough tools to keep you prepared for whatever may come your way. Crank Brothers calls their 19-function mini-tool the “Ultimate Trailside Companion.” This tool packs 19-functions into a compact package that won’t weigh down your bag. If you like to travel lightly, the Topeak Mini 6 will have you covered with the basic functions, including Allen keys, a screwdriver, and flathead in a very compact size. Even if you are running a tubeless wheelset, it’s a good idea to keep a spare tube in your pack at all times. If you’re riding a trail known to cause flats, for example, a rocky trail, it might be a good idea to ride with two spares tubes that day. Keep in mind, you’ll need a properly sized tube for your 29er, 27.5 or 26” bike with the proper Presta or Schrader valve fitment. Tubes are inexpensive, so I like to have a few on hand at all times in my garage. A mini pump is great for those last minute PSI adjustments. Nowadays, you can find two-in-one Presta/Schrader style pumps. A pump can help bail you out in case of a flat or if you need to lend a hand to a fellow rider on the trail. The other option you can go with is to carry C02 cartridges and an inflation adapter for a quick blast of air. Personally, I prefer the pump route instead of worrying about buying C02 refills. The Pro Bike Tool Mini Pump is a compact pump measuring at 7.3 inches in length. It’s compatible with both Presta and Schrader valves and CNC machined of aluminum so it’s lightweight and durable. If you get a flat and need to replace your tube, your life will be a lot easier if you are equipped with tire levers to help sepeterate that tricky tire from the rim. Tire levers are one of the most simple tools a cyclist can have. These Tire Levers from Pedro’s clip together for easy storage in your pack. For those that like to keep extra organized, or if you are limited to the number of compartments in your pack, you can check out options like the CamelBak Tool Organizer Roll. This makes it easy to grab all of your tools at once and helps you keep things organized neatly in one place. When it comes to nutrition, it’s really up to personal preference and what works best for you. You’ll want to take in some calories as you’ll be burning loads of energy on your ride, so the two routes mountain bikers usually go for are energy gels or energy bars. My personal favorites are Clif Bars or GU Energy Gels. Of course, you could always pack real foods – like beef jerky, fruit or trail mix. The ease of packaged energy is just appealing since you can store a few choices in your pack and know they are there if you need it. 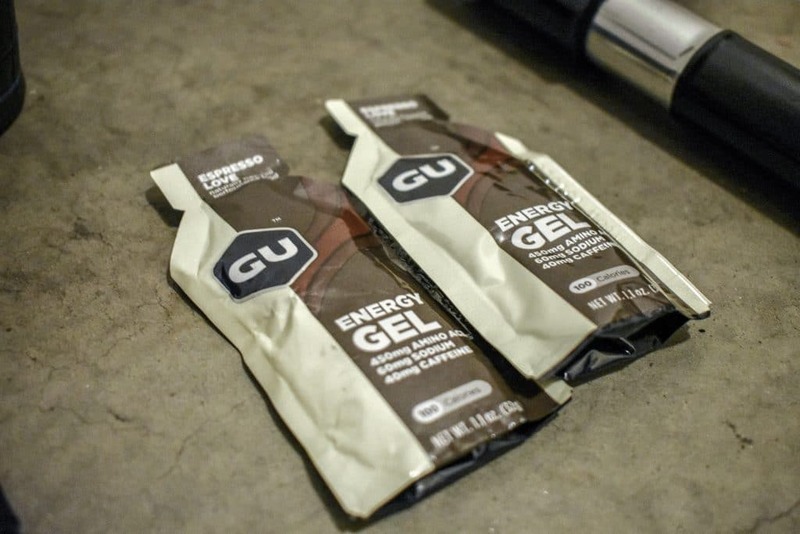 My personal favorite is the Espresso flavored gel for GU Energy, and it doesn’t hurt that it has an extra boost of caffeine to help get you to the top of the trail. The amount of nutrition you’ll want to carry in your pack depends on the length of your ride. Mountain biking has some inherent risk involved, so a small first-aid kit is always a good idea to have in your pack. There’s always a chance for some minor cuts and bruises when you’re out for a ride, so I recommend keeping some first-aid basics in a small portable kit handy at all times. It’s also a good idea to keep some anti-inflammatory pills in there just in case. For longer trips, you may want to consider a more well-stocked first aid kit. You can purchase something like this 66 Piece First Aid Kit or make one yourself of things you already have at home. Lastly, it’s always a good idea to check the weather before you’re going out for a ride. Unfortunately, you can’t always tell if mother nature is going to decide to turn on you mid-ride, so, fortunately, there are some really nice and lightweight rain jackets that you can easily store in your pack for those types of situations. Ultimately, the way you pack your mountain bike riding pack will change over time. As you begin to fine-tune your routines and preferences you’ll get a grasp on what the essential items are for you. We recommend that when packing your bag, you do your best to keep things organized and in the same place. This will help you notice if you are missing anything.